And by Crowe & Mulvey, LLP. Crowe & Mulvey, LLP's medical malpractice and personal injury lawyers have the experience it takes to handle cases involving birth injuries, cancer diagnosis and screening, auto accidents, and brain injuries throughout the state of Massachusetts. www.crowemulvey.com 1(866) 529-6398. Since 1976, MassCOSH has stood side-by-side with our fellow brothers and sisters to fight for safe and healthy working conditions. In those 41 years, together we have made tangible impacts in the lives of working people that have saved lives and kept millions of us from suffering occupational disease. Please check back soon to buy your tickets! 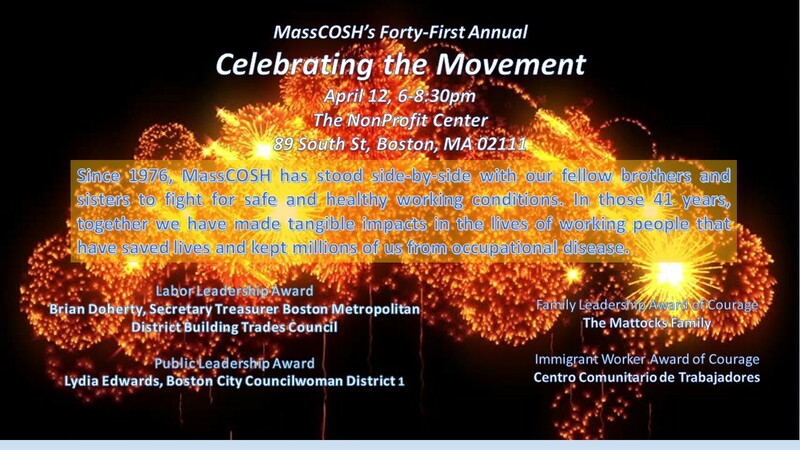 By standing with MassCOSH on this eventful night, you are renewing your commitment to the fight for safe, healthy and fair working conditions. We are also proud to be honoring the achievements of the below individuals and organizations who are embodying the mission of MassCOSH and the values we share. So please, join us for wonderful food, seasonal drinks, and the opportunity to celebrate with friends and partners in recognizing the allies that are changing our workplaces for the better.